Free Printable Aztec Wrapping Paper & Tags! Today’s DIY is such a simple one and would be so perfect for wrapping up your bridesmaids presents! 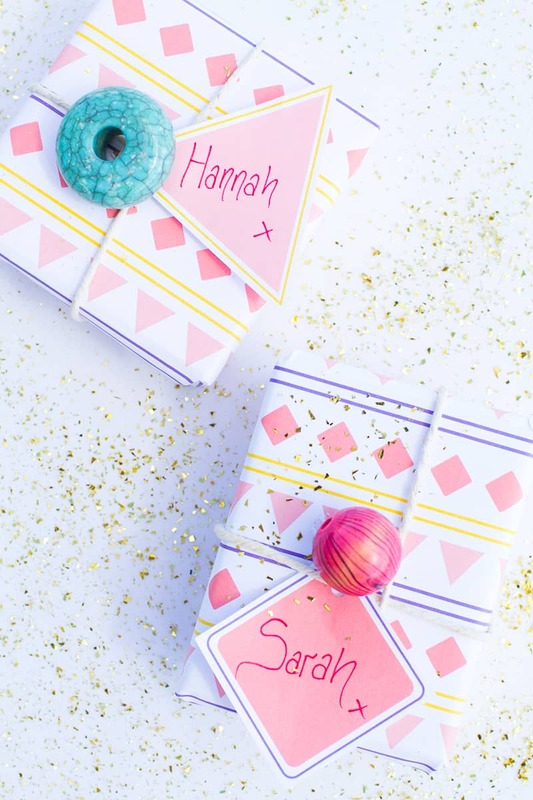 The best news is you can do this completely for free, just download our free printable wrapping paper and our geometric tags and away you go! The beads I used were off an old broken necklace and the string was in the cupboard, these look just as cute without the beads though if you don’t have any! Cheap and chirpy! Step 1: Print & cut out your wrapping paper and tags. Step 3: Until they’re all done! Step 4: Punch holes into your name tags and write whatever you like onto the tags. Step 5: Tie the string around your present and thread the name tag on. Step 6: Finish off by glueing your bead on! I’m totally going to do this for my friends birthday in a couple of weeks! Happy Friday beauts! Printable wrapping paper and tags designed and created by Jessica Turley of Bespoke Bride.